Just brought her down to North Carolina from Rhode Island. Running time 129 hrs. Much fog and bad weather but we are here. Many upgrades to prepare for the trip down to include interior and exterior hull design modification and safety and electronics upgrades. One of the nicest and smartest moves was to relace the existing captains seat with acustom 6 way power captains chair along witha fully reclining first mates seat , located just to the side and a little to the rear of the captain, lest they forget whose in command. And a new whirlpool 18 cu. ft. refrigerator/freezer with ice maker. This boat is a proven seaworthy veseel which is now comfortable to command for up to 21 hrs at a stretch. Being middle aged I wanted to make sure that if I had to be in the helm seat for a long time I was going to be comfortable!!!! If you are looking for a lot of boat for the money, this is it! 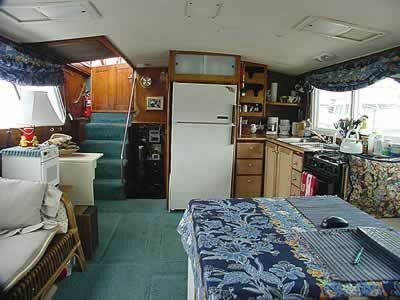 The "galley up" salon measures 10 1/2 ft x 17 ft. The 2 new double glazed glass sliders in the salon are 11' x 2.3 ft each. There is a large forward stateroom with "V" bunks and head complete with sink, shower and electric macerating toilet and Lectra San waste processor. Full hanging closet, 3 drawer bureau, 3 large storage cabinets and a 6 foot shelf plus more. 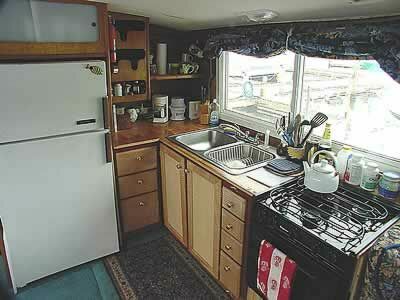 Very large aft stateroom with queen and a head with walk in shower enclosure, new plumbling and custom designed cabinetry. 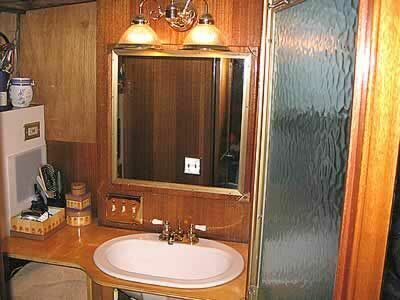 The galley cabietry is all new to the tune of $ $6,000. 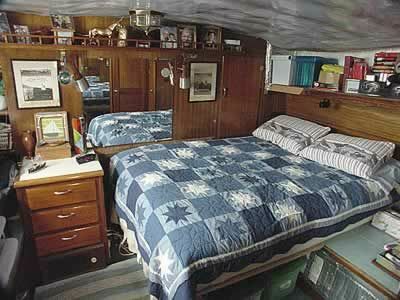 Making this a wonderful live aboard. Structurally the boat is terrifically solid. All planking and fasteners are in exceptional condition. The Deck and cabin area have all been rebuilt and thermally uinsulated for the southern cooling season(NC). 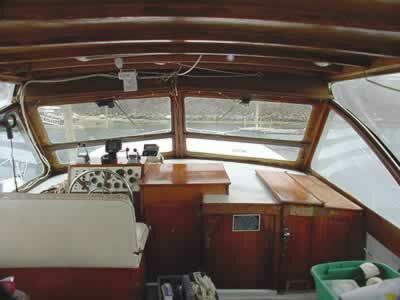 The starboard side and walkway was rebuilt and modified in design to match the port side remodeling project. New in 2004 is a complete computer/TV/ Surround sound/am/fm/CD/DVD /multiplex remote control entertainment and information control center, 200 watt reciever, 2.8 gigahertz computer processor with a 80 gigobyte hard drive, CD Rom burner CD RW, 16x rom drive, windows xp, along with a 17 inch Samsung flat screen , RCA professional series, Bose, Audiophile entertainment/performance system. Engines were rebuilt in 1977, but never run much after that. I installed new Carter 4bbl carburetors, new fuel pumps, new high capacity fuel filters and lines, new electronic ignition systems and components, new regulators, ECU's, rebuilt all alternators, replaced one raw water pump, all belts and most hoses, and complete fluid change and tune ups. Replaced all 4 cutlass bearings and realigned with new fasteners all running gear. Several of the exhaust elbow parts have been renewed and others might need to be in the future. Any and all engine wiring problems have been addressed prior to the trip south. Call and talk boats with us if you are looking for an alternative lifestyle.